Until tonight. 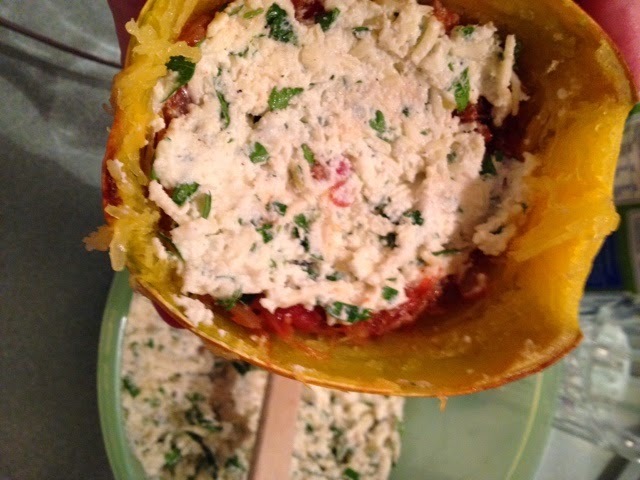 Tonight I decided to make Spaghetti Squash Lasagna. 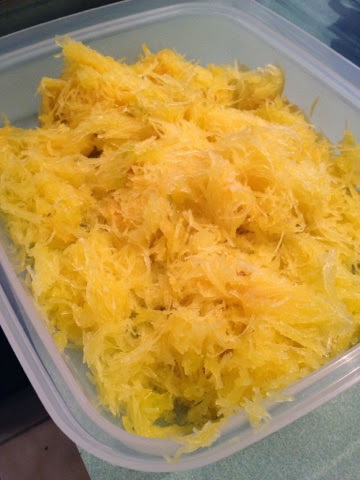 While I came across this in a mindless night on Pinterest…I would love to give credit where credit is due, but I mashed up so many recipes, I’m not sure who to give credit to, so I guess I’ll take it!! 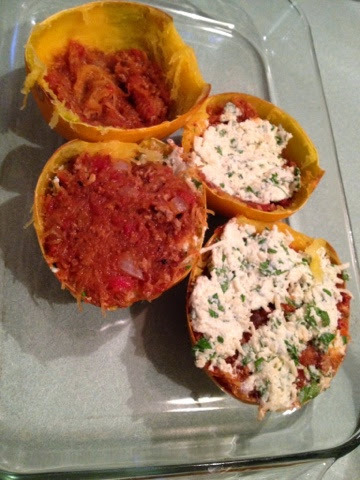 With most dishes, I run the risk of my reviewers….well, ok, my husband. I usually get an “it’s good”, or “eeeh….you don’t need to make this again.” Tonight’s dish was a “wow, this is really good”. So you know that you should try making this. So with a review like that…you’ll want to make this one! 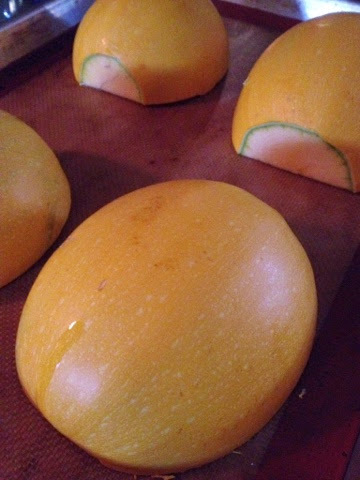 **Side note: I used the smallest Spaghetti Squashes I have ever seen, and it still had enough squash mixture to make a 8x8 casserole. 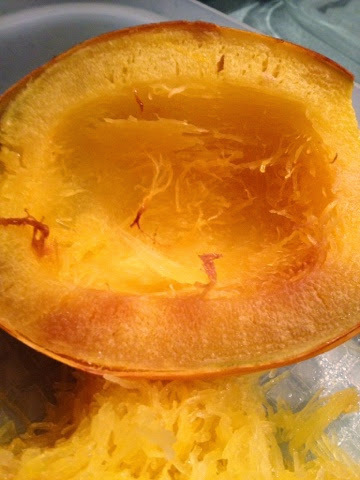 While the squash is roasting, warm the olive oil in a high-sided skillet or saucepan over medium-high heat. 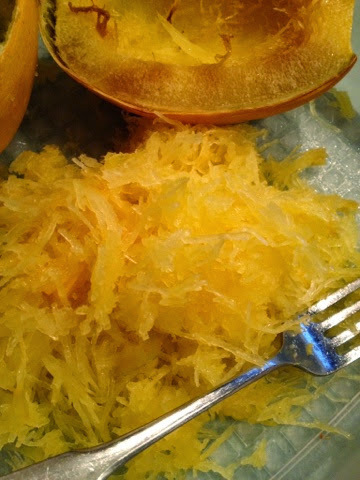 Stir in the onions and cook until translucent, 5 to 8 minutes. Stir in the garlic and cook until fragrant, 30 seconds. Add the ground beef and 1 teaspoon of salt. Cook until well-browned, breaking up the ground turkey into small crumbles, 5 to 8 minutes. Stir in the crushed tomatoes and bring to a simmer. Continue simmering the sauce until the squashes are ready, 5 to 20 minutes. Taste the sauce and add more salt if desired. 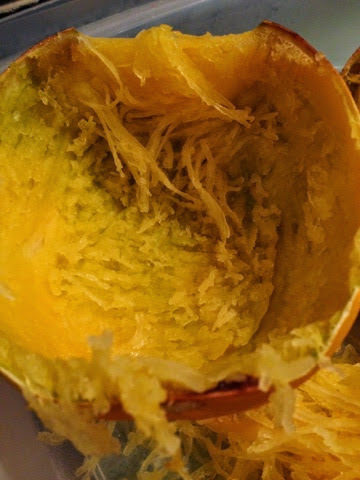 Use a fork to shred the inside of the squash, down to the shell. 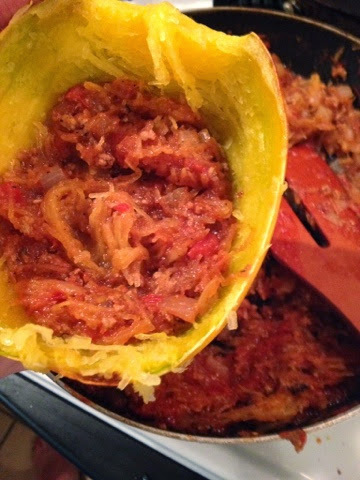 Mix the shredded squash into the tomato meat sauce. 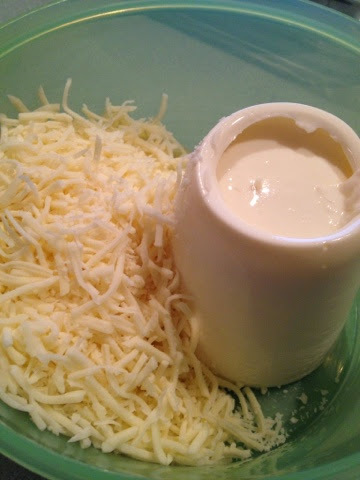 In a separate bowl, mix together the ricotta cheese, mozzarella and the parsley and 1/2 teaspoon of salt. 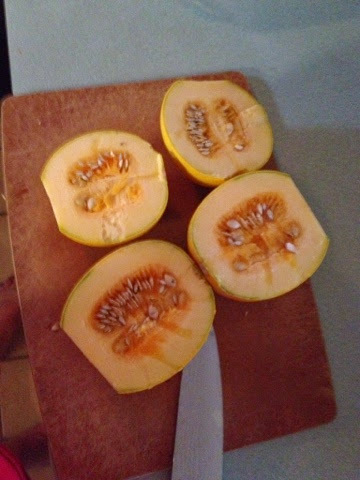 Wipe out the roasting pan and arrange the squash shells inside, like bowls. Divide half of the ricotta mixture between the shells, using a spoon to spread the ricotta evenly over the bottom of the shells. Divide half the tomato sauce between the shells, spooning over top of the ricotta. 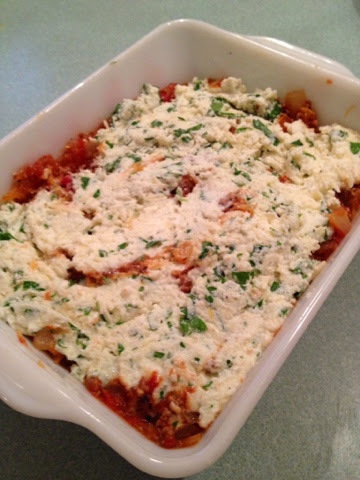 Top with another layer of ricotta and tomato sauce. 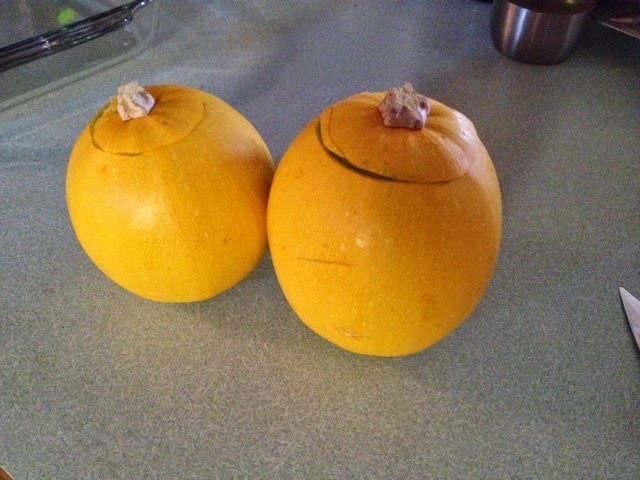 → At this point, the shells can be covered and refrigerated for up to 24 hours. Add an extra 10 minutes to the cooking time. 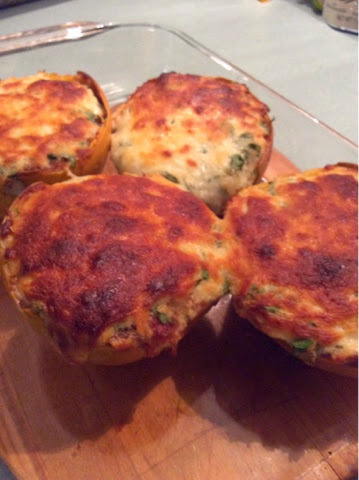 Sprinkle parsley or basil over the tops and serve immediately. Leftovers will keep for 1 week in the fridge.